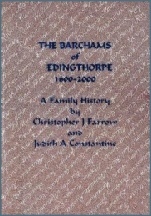 The Barchams of Edingthorpe and Thomas Barcham's Historical Notices are both out of print but are available on CD. The Barcham Family CD also includes Barcham family trees, and personalized trees and genealogical reports for your branch of the Barcham Family. If you would like a copy of the CD please contact family@barcham.org.uk for an order form. It is free to bona fide members of the Barcham Family, although a donation is requested to cover mailing costs. If you would like to have a family tree printed we will be happy to supply pdf or gedcom files on request for your branch in whatever style you prefer with or without a background image – family photos can be added if you wish. My History offers a printing service for large family trees. Prints of your tree would make an excellent Christmas or birthday gift for members of your family. There is no charge for family tree files. Donations towards the cost of maintaining our domain name and the website are always much appreciated however. Please contact family@barcham.org.uk for more information. An earlier publication, first printed in 1857 by Thomas Barcham of Reading, entitled Historical and Biographical Notices of the Barcham Family was also reproduced in 2003.